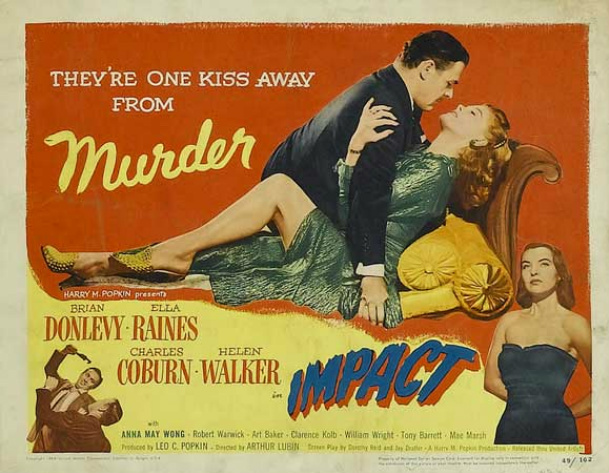 Impact is a wholly typical domestic noir in which a wife plans to murder her husband and get away with it by playing stupid. This was a hugely popular motif in the ’40s, with a lot of scripts scratching at the coattails of Double Indemnity. While that film leaves imitators in the dust, some of the them have just enough to offer to be worth a watch. Case in point: Impact, a fun, but lazily directed film that proposes an intriguing legal case though bores terribly during the second act. Walter Williams (Brian Donlevy) is a hot-shot businessman who buys and sells factories like they’re going out of style. I literally have no idea what he really does for a living except buy factories. His introduction in the film includes influencing a board of directors and having a secretary do menial tasks for him. The guy’s got to be important, right? So he’s planning on driving from San Fran to Denver to open some more factories, when his wife, Irene (Helen Walker), comes down with a mean toothache. She explains that while she can’t go, it would be nice if Walter drove her nephew Jim Torrance (Tony Barrett) back to Denver. This is how her scheme is gracefully set in motion. See, Jim is really Irene’s lover, and he’s planing on killing Walter during their little road trip so he and Irene can be together. The hit goes hilariously wrong, and Walter is left alive, while Jim goes up in a ball of flames – the police believing his corpse is actually Walter. Scorned, confused, and believed dead, Walter pulls himself outta the primordial muck and hitches a ride to Nevada, where he takes up employment as a garage mechanic under the goddess Ella Raines, who plays an impossibly supportive grease monkey. This is where Impact begins to drag its heels a bit. Scenes of Walter’s new life as a mechanic are cut with doses of Irene trying to convince the cops that she had nothing to do with her husband’s murder. Once Walter emerges from the netherworld, the film does become very interesting – with a trial that jumps back and forth between right and wrong, who murdered who. The direction by Arthur Lubin (who helmed some Abbott and Costello films) is very drab. The camera doesn’t do anything worth noting besides sit still and watch people talk. Even the scenes that are supposed to be suspenseful are shot in a matter-of-fact manner, leading to a drab and uninspired looking film. And while the mighty Ella Raines performs to her usual perfection, the other actors feel terribly lifeless. Despite these hiccups, Impact is worth watching for the entertaining story alone, particularly during the trial, when the legality of corpse accountability comes into play. It may not possess the intrigue or finesse of Double Indemnity, but this notable little thriller is certainly worth a lazy afternoon watch. Never saw “Impact”. But Helen Walker is so incredibly devastating as Dr. Lilith in “Nightmare Alley”. Is she really unmemorable as the murderous wife here? It’s not that she’s unremarkable, it’s that her character is.